History of Idaho, Volume 2, by Hiram T. French, M.S. 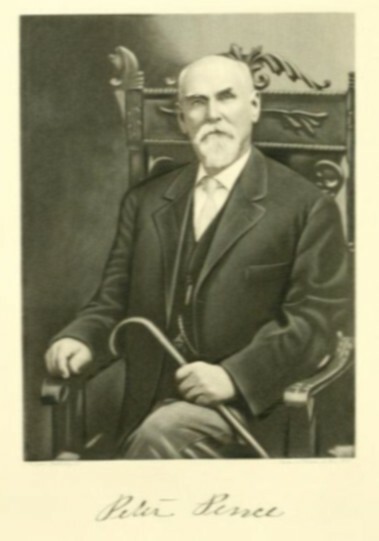 Among the sterling old pioneer citizens of Idaho, Peter Pence holds distinctive prestige as one who has been unusually active in advancing the progress and prosperity of this great western commonwealth. He has lived in this section of the country since 1862, and here has been engaged in numerous enterprises that have brought success to himself and that have reflected credit on his fair and honorable business methods. It is to the inherent force of character and commendable ambition and unremitting diligence of Mr. Pence himself that he steadily advanced in the business world until he now occupies a leading place among the active and representative citizens of Payette. A native of the fine old Keystone State, Peter Pence was born in Armstrong county, Pennsylvania, October 12, 1837. He is a son of George W. and Deborah (McKee) Pence, both of whom were natives of Pennsylvania, and where the former was born in 1810. The father was engaged in agricultural pursuits and in the meat business during the major portion of his active career, and he was summoned to eternal rest in 1906, at the patriarchal age of ninety-six years. His cherished and devoted wife passed away in 1839, when the subject of this review was but eighteen months old. There were other children in the family, namely; Andrew, twin of Peter, died in childhood; Mrs. Maria Ellen Wilson, the mother of Congressman Edgar Wilson, of Boise; Elizabeth Ann, the wife of Robert Lowery, of Pennsylvania; Albert of Payette; Mrs. House, of Brooklyn; and Mrs. Handy, of Denver. To the public schools of Armstrong, Pennsylvania, Peter Pence is indebted for his preliminary educational trailing. After leaving school he worked for his father for several years and in 1858 left Pennsylvania and went to Atchison, Kansas, whence he later went up the Missouri river to St. Joseph. In 1860 he went to Pikes Peak, Colorado, where he sojourned for a short time, eventually returning to Kansas, and there engaged in farming. In 1862 he came to Idaho, leaving the Missouri river at Atchison, Kansas, June 9th, and reaching this locality about October 1st. He traveled with ox teams, passing through many narrow escapes from Indians in crossing the continent. He settled in the Boise basin, where he was interested in mining projects, and where he remained for about one year. He then turned his attention to the freighting and packing business between Yumatilla, (sb Umatilla) Oregon, and the Boise basin and Silver City, and in 1864 he packed one load of freight into the latter place at twenty-eight dollars per one hundred pounds. In Silver City he also sold ten-pound cans of lard for ten dollars a can, oats at thirty dollars per hundred pounds, bacon at one dollar and a half a pound, this being in June of 1865. In 1866 he ran a threshing machine, and in this connection cleaned up about fifty dollars a day during 1864-4-5. At this time also provisions in the mining districts were usually expensive, flour selling for a dollar a pound, apple pies at a bakery for a dollar apiece, bacon for a dollar and a half a pound, ham for the same price, and lard for ten dollars a can. In 1867 Mr. Pence went into the state of Washington and purchased a drove of cattle, which he brought to Idaho. He then engaged in farming and stock raising on the Payette river, about ten miles above the present city of Payette, and there remained for a number of years. In the years 1880 and 1881 he drove herds of cattle out of Payette valley into Wyoming, shipping the feeding steers to Omaha, Nebraska, and there getting three and three and one-quarter cents per pound. Since 1882 he has lived in Payette, and here he now vice-president of the First National Bank and of the New Plymouth Bank. He has money invested in a number of important business enterprises and is vice-president of the Idaho Canning Company. In politics he owns allegiance to the Republican party, and it is worthy of note here that he was the first mayor of Payette. He has served as school trustee, and during his administration was purchased the block where now stands the beautiful brick school building, surrounded by splendid shade trees set out at that time and under Mr. Pence's supervision. In 1900 he was a state representative. He is a man of broad and deep human sympathy, his innate kindliness of spirit having won him the everlasting friendship and esteem of all with whom he has come in contact. Although seventy-five years of age, he is still hale and hearty, and it is with a spirit of satisfaction that he looks back over the past and realizes that he has been an important factor in making Idaho one of the substantial states of this great western empire. On October 6, 1872, was celebrated the marriage of Mr. Pence to Miss Anna Bixby, a daughter of Seth and Ellen Bixby, who crossed the plains from Missouri to Idaho in 1862. Mrs. Pence died July 18, 1906, in Payette, and here her loss was uniformly mourned by a wide circle of appreciative and loving friends. Concerning the six children born to Mr. and Mrs. Pence, the following brief data are here incorporated; Emma Belle is the wife of F. M. Satorris, of Payette, and they have two children; Edward C. is married and resides in Boise, Idaho, and he has two children; Lloyd, whose home is in Payette but who spends his summers at Big Willow, is married and has five children; Harry B.; Walter. ; and Grace, who is the wife of R. D. Bradshaw and has three children. Harry B. and Walter G. are both married and occupy the old homestead. This homestead was the first location made on Big Willow Creek, and was made in 1867, one year before the country was surveyed and it was then and is now the best stock ranch in the surrounding country. It was at this ranch in the years 1877-1878 that the Snake Indians as well as the Shoshones, Blackfeet and Nez Perces started in to drive all settlers out of the Snake River and Payette valleys or take their scalps. But the frontiersmen rallied to arms, built stockades, put their families in them and kept on the lookout. Mr. Pence remembers many times taking his bed and little ones and going to the grain field to sleep and leaving the home. And then looking up many times through the night to see if the redskins had fired the home yet. Mr. Pence had two brave cowboys, Albert Wilson and Albert Packson, who stayed in the house after the family left, but finally they went to the highest hill close by where they could overlook the valley at which place they did see the Indians telegraph from one mountain top to another. This was done by firing bunches of cut off dried grass and moving it in a certain manner. Those signals would be given from one mountain top to another, telling other warriors where they were and how many scalps they had taken or where the soldiers were, etc. Finally Mrs. Pence and the small children got too restless and the dangers increasing daily, Mr. Pence left the home, and took the family to Boise City. Here he went into the army, joining General O. O. Howard with several hundred men, both infantry and cavalry, who kept the Indians moving from mountain to mountain and driving all warriors out, of Southern Idaho and Eastern Oregon, through Northern Idaho into and through the Lulo Pass into Montana. Chief Joseph had by this time become head chief of all the tribes. One incident that took place on the old homestead at the mouth of Big Willow Creek; Fifteen warriors got within fifty yards of the house when Mr. Pence and his wife were alone. The only thing to do was to stand them off, which they did by getting their guns and bringing them to bear on the leaders, who were all mounted on their best ponies and dressed in full war paint. Standing in line for several minutes, having their repeating muskets on their shoulder, Mr. and Mrs. Pence bade the leaders repeatedly to go back, which they did eventually without bloodshed. Mr. Pence spends the greater part of his time with his children, whom he has started well in life, and who are now enjoying prosperity and happiness which in turn renders him the greatest happiness.